Our deal hunters want to surprise you with some discount Emirates Airlines flights to the Middle East this November. Book by October 25 and you can travel cheaper to the Middle East from Nov 1 to December 9. 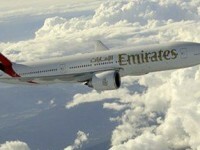 Take a look at these Emirates flights we just found. Search for the prices and other Middle East flights in the below box. Emirates Airlines might not be the cheapest way to get to the Middle East, but the airlines high quality services and reliability are well known and awarded multiple times. * Price includes taxes and fees – baggage fees are not included, they are applied by the airline. This entry was posted on Monday, October 8th, 2012 at 10:51 am and is filed under Airfare Deals. You can follow any responses to this entry through the RSS 2.0 feed. You can leave a response, or trackback from your own site.